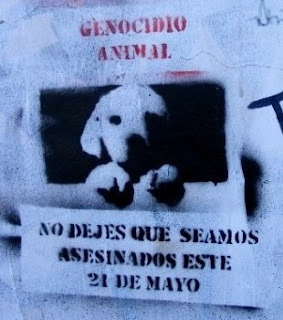 My Life in Chile: Doggy Genocide! When I first heard this, I thought it was some sort of awful rumor and I thought “who would make this up in their mind?” With a history such as Chile’s, we have apparently resorted to killing dogs instead of humans! In my Spanish writing class I received an article over this event and was asked to give my opinion as an assigment. Apparently, this event was really going to happen! As I have already mentioned before, there are packs and packs of stray dogs here in the streets and in the event of the President of Chile coming to town, they plan to kill them so they won’t get in the way of the holiday festivities and parades. Now, what is even worse is that they round the dogs up in the nighttime and then kill them by injecting chlorine into their veins. I’m sure if PETA knew, they’d be all over this one. This tragic event has been set for May 21, 2009. Fortunately I was in San Pedro on May 21, but upon my return, I noticed the lack of stray dogs in the streets. They really did carry out their plan of killing them. Not all of them, but a significant amount to notice that they went missing. I heard that they had taken the worst ones, which I guess was good since a lot of the dogs here are sickly and have a lot of health problems. The primary issue of the abundance of stray dogs is that as soon as a pet dog has a problem that requires medical attention, it is pushed out on to the street to live as most Chileans cannot afford to care for their pets. And there is no shelter where the dogs can be taken to. Coca Cola in glass bottles!